Add Bracelet Length to Plaque Width for total length of bracelet. 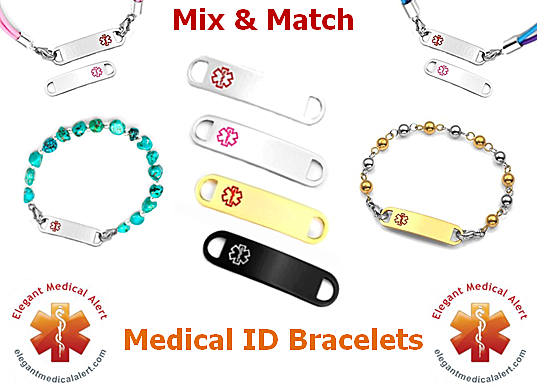 Medical ID bracelet with stainless steel plaque. 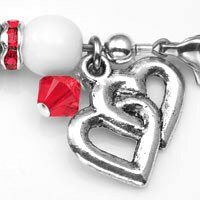 This silver and white beaded bracelet with red trim has an Interlocking Hearts charm to symbolize the love between a couple, family members, or best friends. 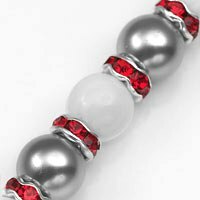 Bracelet is made of pearlized silver and white Czech glass beads, silver plated beads with red rhinestones, a light Siam Swarovski crystal, and an antiqued, weathered silver plated charm. Beads may vary slightly in style or color. Clasps are stainless steel. Displays a medical alert symbol on a plaque which may be engraved on front and/or back. Plaque measures approximately 1 1/2 x 3/8 inch and attaches to the bracelet with lobster clasps. This is a MIX and MATCH bracelet! The plaque is interchangeable and can be worn with any of our other MIX and MATCH bracelets with a 1 1/2 inch length plaque. I got my bracelet and it's so pretty. Everyone at my job likes it. Thanks again! good experience... you guys are awesome. I love that this bracelet because it's hard to slide on and off. My mom has dementia and i don't want her taking it off, although she tries. I am very happy with my purchase.